This Single Malt, An Oa, includes all the complexity of the Ardbeg whiskys with, in addition, a contrasting roundness brought by a particular aging. New reference of the year 2017, the Ardbeg An Oa takes its particular name from the cliffs "mull an Oa" located at the southwestern tip of the Islay island. This part of the island is the wildest with its cliffs that rise above the Atlantic Ocean and face the winds, thunderstorms and waves to better protect the south coast of Islay. This whisky is pronounced "An Oh!" and is characterised by these contrasts, creating a complex whisky and singularly rounded thanks to its combination of three types of barrels: the Spanish wine barrels Pedro Ximenez bring softness, charred oak barrels bring the spicy notes, the old barrels of Bourbon bring the intensity. More subtle than the Ardbeg 10 years, peat is less present at the start. 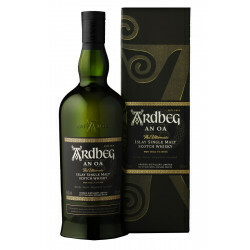 The result is a smoky, soft, round whisky, to which is added all the power and intensity of Ardbeg. Nose : rounded and smoky with creamy toffee, aniseed, treacle and dates. Palate : a smooth, creamy texture leads into a huge syrupy sweetness, flavours of chocolate, toffee, aniseed, orange and smoky tea leaves. Gentle, sweet spices (nutmeg & cinnamon), some cigar smoke, and a very unusual flavour of grilled artichokes. Wood is always present in the spirit, gently nutty and reminiscent of a carpenter’s workshop. Finish : lingering, seductive, gentle yet intense, with flavours of aniseed and distant subtle smoke.